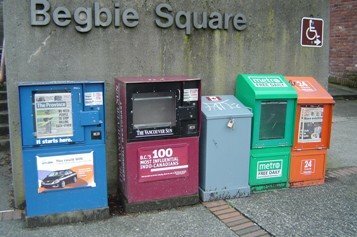 Vancouver newspapers: A comprehensive guide to Vancouver newspapers. Vancouver newspapers. 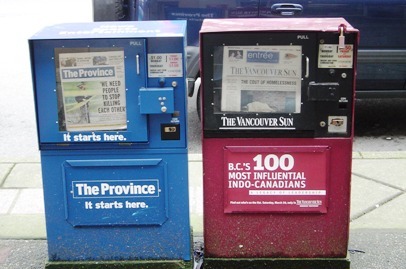 This is a comprehensive guide to newspapers published in Vancouver and surrounding area. The Metro is free and published everyday. Look for the Metro in the green boxes everywhere. 24 Hours 24 hours is free and published everyday. 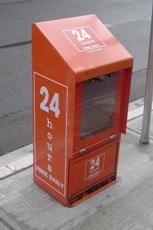 Look for 24 hours in the orange boxes everywhere. Vancouver Sun The Vancouver Sun newspaper is published daily except for Sundays. Available at most newstands or convenience stores or in the brown newspaper boxes. The Vancouver sun is not free and will cost you about $1 Monday through Thursday and $1.50 on Friday and Saturday, taxes not included. Vancouver Province The Vancouver Province newspaper is published daily except for Saturdays. Available at most newstands or convenience stores or in the blue newspaper boxes. The Vancouver Province is not free and will cost you about $1 Monday through Thursday and $1.50 on Friday and Sunday, taxes not included. The Buy and Sell Vancouver edition is published every Thursday and available at most newstands and convenience stores everywhere. This is a paid publication and isn't a newspaper at all. Instead the Buy and Sell is a list of weekly classified ads that cover a wide spectrum of the marketplace. The Buy and Sell Vancouver edition is an excellant source for cars. If you are looking to buy a new or used car I recommend the Buy and Sell Vancouver edition. You won't find a publication anywhere in Vancouver that has a more exhaustive list.Select British Columbia through the link above. 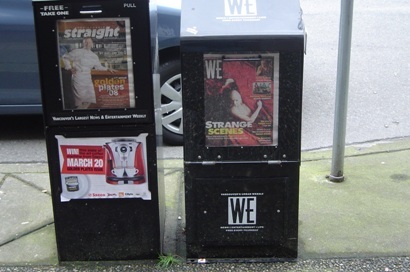 Other Vancouver Newspapers, Surrounding Areas. The Tyee covers most of the Province of British Columbia much like it's printed counterpoints the Vancouver Sun and the Vancouver Province. But unlike the latter The Tyee only exists online and is worthy to be considered a Vancouver newspaper.Return from Vancouver Newspapers to Home.